Itchy hands may be caused by a variety of skin conditions including psoriasis, poison ivy, chickenpox, winter itch, dry skin or eczema. Scratching your hands may feel satisfying, but dirt and bacteria underneath your fingernails can cause an infection on the skin. Once you check with your doctor, you can treat itching hands with at-home treatments. When your hands feel itchy, soothe them with an oatmeal bath. Colloidal oatmeal, or oats ground into a fine powder, is an effective remedy for itchy skin. This treatment will provide the soothing skin benefits of oatmeal without clogging the bathtub or sink drain. 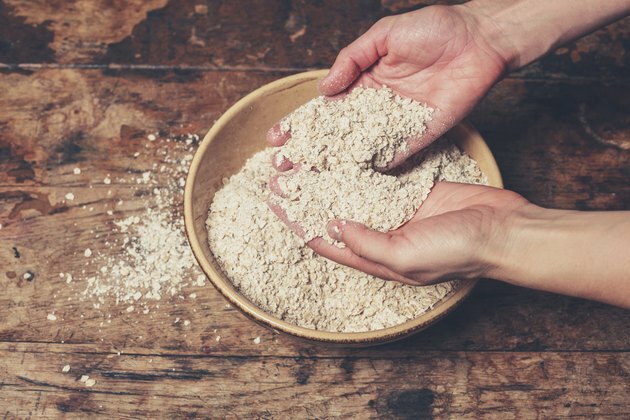 Pour a handful of colloidal oatmeal into a bathtub or sink of lukewarm or cool water, then submerge your hands completely for 10 to 15 minutes. Some soaps, particularly harsh ones like antibacterial soap or those with strong fragrances, can cause irritation to the skin. To prevent skin reactions and soothe your itching hands, wash them only with unscented cleansing lotion that is formulated for sensitive skin, recommends Dr. Leonard Swinyer, clinical professor of medicine at the University of Utah in Salt Lake City. Although it may feel good on your itchy hands, do not scald them with hot water. Instead, wash your hands only when you have to and use cool or lukewarm water. Itchy hands can become worse the more you scratch them. To prevent scratching your hands in your sleep, wear 100 percent cotton gloves. This will help protect your fingernails from scratching your skin. Wash the cotton gloves only in mild, unscented detergent to help reduce irritation to your skin. If the itching sensation becomes unbearable, wet a washcloth or piece of clean gauze with cold water and apply it directly to your itchy hands. Cold, wet dressings can help temporarily numb the skin and reduce itchiness.